We all have family stories. Sometimes they're accurate. Sometimes there's a grain of truth in them. And sometimes they're just plain wrong. My great-great-great-great grandfather was Dovid Rutner. I heard from two separate lines of the family that he was the first Rutner to go to Kolodne, after being sent there by Rabbi Menachem Mendel of Riminov to strengthen the Jewish community of Kolodne. I was also told that Dovid Rutner was the father of (Avraham) Leib Rutner, who was the grandfather of the "other Shmuel Moshe Rutner" who wasn't my great-great grandfather. The years seemed a bit off (Menachem Mendel of Riminov died in 1815, when Dovid would have been about 21, but perhaps Dovid was a prodigy who was sent to Kolodne just before his mentor's death), as multiple people had a similar version of this story. 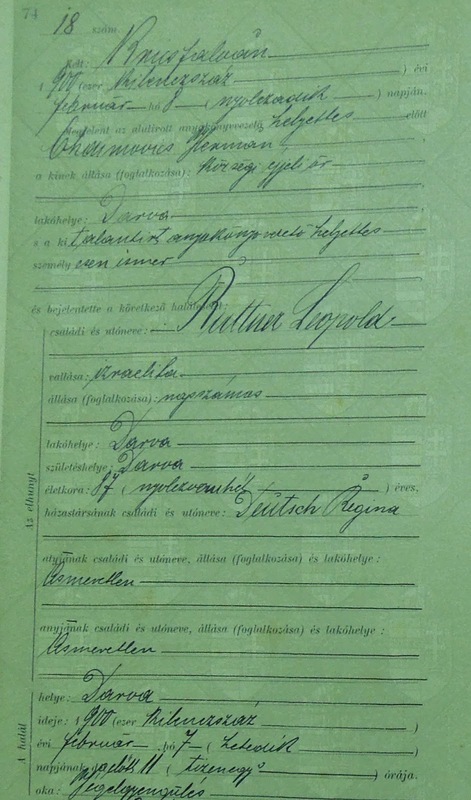 Avraham Leib Rutner's death record didn't help to confirm or deny the story. Before leaving the mountains, we made one more stop in Kolodne. When we had been there two days earlier, we were told of a woman named Nanika, whose husband had been a Jewish man named Avrum who had survived the war. He eventually converted, changed his name to Ivan, and married Nanika. Avrum/Ivan had died years earlier, but perhaps Nanika knew something about the Jewish community. Mikhael picked us up again the next morning. Once we heard we were heading to Dulovo (formerly Dulfalva), he said he had a friend in that town, just had he had in Kryva the previous day. We drove up into the mountains and picked up Mikhael's friend who directed us to the Jewish cemetery. There was a man in the cemetery with a chainsaw and axe clearing it; he told us that a man named Israelovitch from Kiev had approached the town mayor about cleaning it up, and this man was hired. 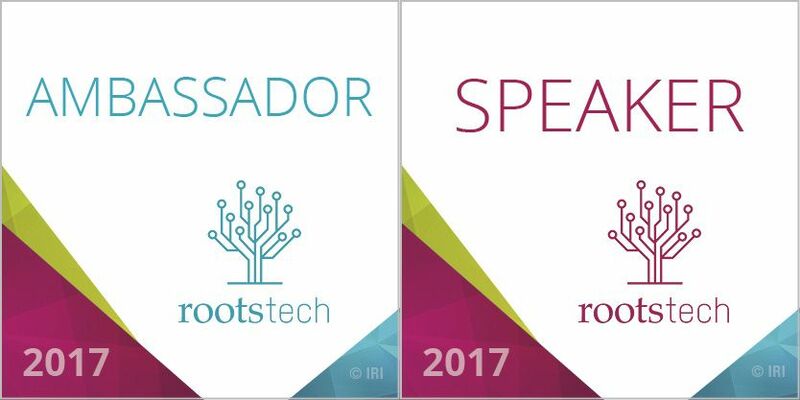 I'm thrilled to be both a speaker at and an ambassador to RootsTech this year. If you haven't ever been to RootsTech, you're missing out. It is the largest genealogy conference in the world, with over 200 sessions, the most enormous exhibit hall I've ever seen at a conference of any type, and tens of thousands of attendees--last year they had over 28,000 people! I'll be speaking on Thursday (date subject to change), so drop by and say hi! 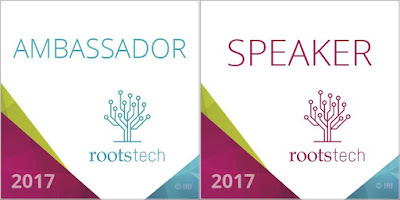 So, how do you get to RootsTech--potentially with free admission? Next, we headed towards Bilovartsi, home of my Vizel family. We asked for directions to the Jewish cemetery and after driving down a gravel "road," we thought we were there but didn't see any cemetery. There was an old lady nearby, and we asked her, and she pointed up. And that's how I ended up going mountain climbing in Ukraine. We started out early Wednesday morning with Mikhael picking us up in the center of Khust. He asked where we wanted to go, and I said Kryva (accenting the first syllable). He was confused. I repeated it several times and finally brought it up on Google Maps. His response: "Ah, KryVEH!" Apparently the accent is on the last syllable, and it makes a difference. My Vizel family lived in Kryva and Bilovartsi right across the river. I hypothesized that Michael and my mother were descended from one woman who relatively recently had a mutation that differentiated her mtDNA from the mtDNA shared by those 200+ people. Michael took an autosomal test to see how closely we were related. And his results are in. At this point, it was mid-afternoon, so there were still a few hours of light left--so I wanted to head towards Kolodne. We tried to hire the one cab waiting nearby, but the young driver (after checking for Kolodne's location) wasn't comfortable driving into the mountains--so he called an "old man" who knew the mountains better. When Mikhael "Misha" showed up, he was a man probably in his 40s! I guess everything is relative. Mikhael was game for driving to Kolodne, so we set out.